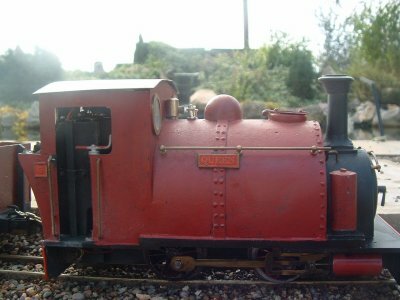 Since this website was started the collection of diesels and steam locos have naturally increased, below are a few photos of those on the rostra and some that are no longer. No.3 ‘Ron’ started life as an I.P. Engineering kit of a ‘Simplex’ caravan. Sadly the chap in the workshop is a bit of a moron regarding white metal kits and by the time he had finished with it, poor old Ron looked as if it had been hit by a 120mph high speed train. The management decided something needed to be done so she stripped the model and instructed the workshop staff to fashion new body work, ballast and so on. After a stressful week of double shifts, Ron emerged as a scratch built loco, resembling prototypes typical on 1950’s narrow gauge railways all over the UK. Well, he does from a distance, with the light just right, with one eye shut. 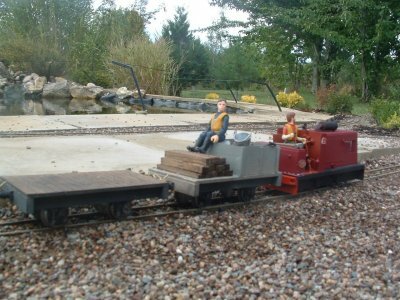 Despite all the above, Ron has proved to be invaluable to the MPLR hauling wagons from the gravel workings to Ongar station. 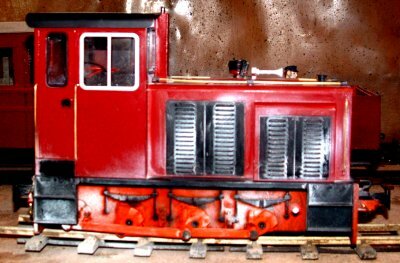 No.6 ‘Adolph’ was purchased from the Compton Down RW. Based on a Ruston, Adolph has had a long and varied career. 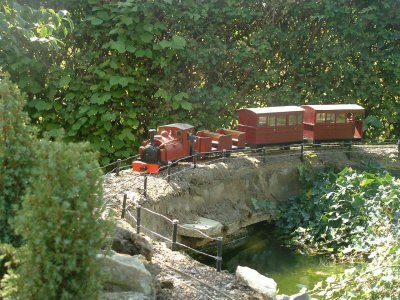 Scratch built by Mr Harvey Watkins, there is a wealth of detail both in the cab and elsewhere. 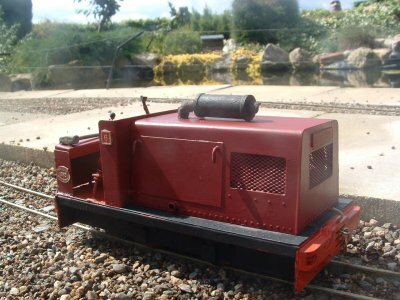 Following delivery to our workshops, Adolph was given a quick respray in MPLR livery, had a modified exhaust fitted and recieved extra ballast weights. It is planned to convert Adolph to 4wd using I.P. parts in the very near future.Â We are sure that Adolph will prove to be a very useful locomotive indeed and is already proving a hit with the PW team. No. 7 is an Accucraft Baguley-Drewery 0-6-0 (battery) diesel loco. 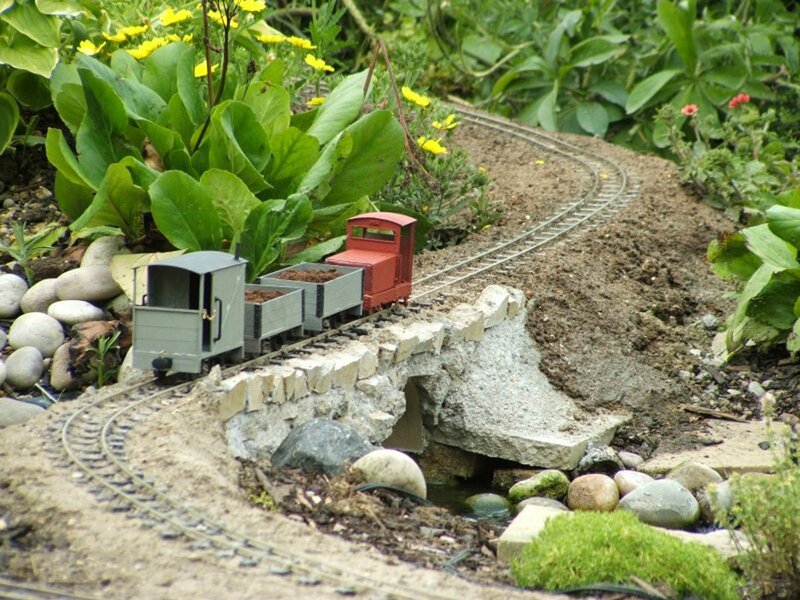 It is converted from the standard track powered version and is fitted with no less than 10AA cells and two switches for forward and reverse and ‘shunting speed’ and ‘running speed’. As if this was not enough, the Baguley is also fitted with the ACME sound card which really does sound like a ‘proper’ diesel loco. The Baguley will come in handy for recovering steam loco’s, which always seem to run out of steam miles from anywhere, plus hauling passenger services ‘off peak’ and in very inclement weather. 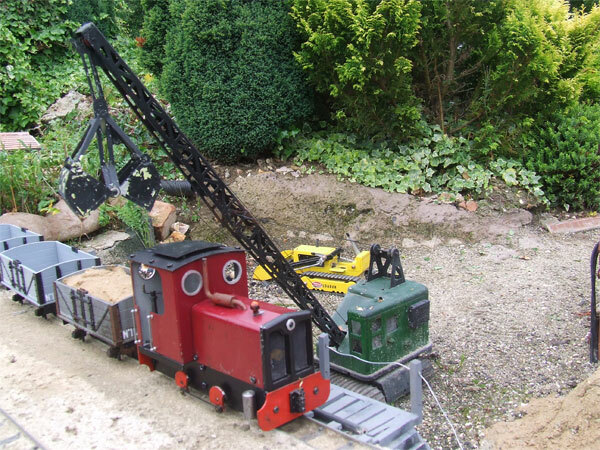 Unfortunately this vehicle proved unsuitable for the MPLR and is now in preservation on a narrow gauge railway in Kent. 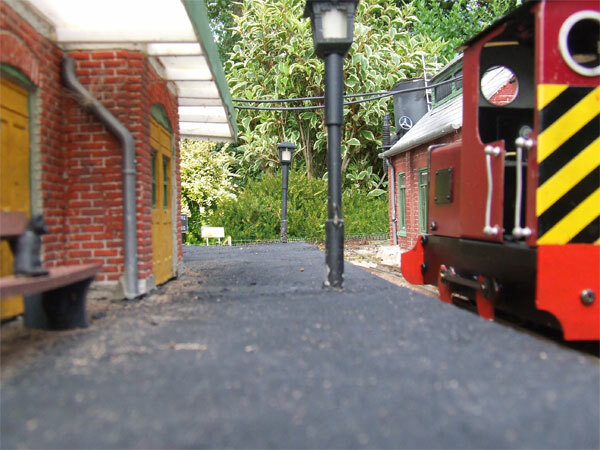 Jessie is an IP Engineering kit-built diesel.Â Â She is a very useful loco and now that the Baguley-Drewery has gone, is the mainstay of the goods service on the MPLR.Â She can be seen below waiting for her wagons to be loaded at the gravel pit. But, she is just as likely to be seen taking her turn on the passenger run, here she is having been snapped by an enthusiastic train spotter at Moreton Pit Station. No 4 ‘Arthur James’ is an Accucraft Mortimer, and was the first ‘big’ purchase of the MPLR.Â He is well traveled having been hauled up from Frome in Somerset!Â A real stalwart and favourite with all the drivers.Â Arthur can usually be seen on the passenger service with his own set of MPLR workshop built coaches, sometimes as in the photo below he takes the PW staff out to check on the line! Â ‘Taffi’ is a kit built Roundhouse Katie and he is named after a very dear and loyal friend.Â Taffi is probably the favourite of the Fat Controller (but don’t tell Arthur!) and can always be relied on when there is a job that needs doing, much like his namesake! Â Always a great one for the unusual, Mr Fat Controller was surprised himself when he received a Regner ‘Willi’ for his F****tieth birthday present!Â Even more surprising was having to go to Scotland to get it (but that’s another story, see Diary page August 2007).Â Jock McCockney, Willi’s driver, has really settled in to living in Essex and is quite a common sight on the MPLR, apparently tartan is very ‘in’ this year!Â Willi spends most of his time hauling loaded wagons from the gravel pit. 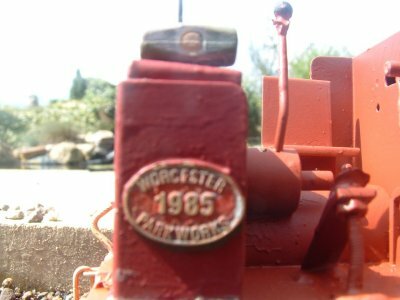 ‘Vincent’, another Regner, was actually a purchase (on a whim) by Mrs Fat Controller.Â So impressed was she with ‘Willi’ that she wanted one for herself (a Regner that is)!Â Vincent is a fine little chain-driven steam engine, based on an Aveling & Porter steam engine. Vincent is a great all-rounder but makes a handsome sight complete with a fine set of carriages on the ‘Vintage’ passenger run. No 5 ‘Queen’ is another locomotive that was purchased from the Compton Down Railway and is based on ‘Prince’ of the Ffestiniog Railway, a superb example of her type.Â Built originally by Peter Jones many moons ago she is now in her dotage and is considered the ‘old lady’ of the MPLR.Â She only ever runs the passenger service on high days and holidays, and in the best of weather! Lastly, is ‘Noel’ a kit-bashed Locolines ‘steam’ engine, given to Mrs Fat Controller by Mr Fat Controller as a Christmas present.Â Built in the MPLR workshop under the watchful eyes of Mrs Fat Controller herself, Noel was a few weeks in the making! Â Noel is often seen pulling the box vans on the goods service.